GlassWorks is acknowledged as the favored destination for customers who are looking for top quality in shower enclosures and glass shower stalls. For more than 37 years and counting, GlassWorks has been the number one choice for installation experts of architectural glass that serve the residents of the Greater Chicago Metropolitan Area. We strive to make sure that we have numerous different types of shower enclosures that will gratify our consumers and that’s why they continue to come back. Our professionals at GlassWorks have the skill and understanding to give you the glass shower enclosure that you have been wanting for your bath and we take care of all of your glass shower enclosure needs professionally. Since 1997, we have been handing out our award-winning services to the residents of Winnetka with our comprehensive variety of glass shower enclosures and glass shower stalls that they love. Here at GlassWorks we serve an average of 4,000 customers every year! GlassWorks can alter any glass shower stalls and shower enclosures to make it precisely how you want it. The populace of Winnetka take pleasure in making their own shower enclosure designs. Furthermore, our unique glass shower enclosures and glass shower stalls will give your much needed bathroom a whole different modern look. Plus, our shower glass is referred to as “safety glass” that ensures you are protected within your shower glass structure. Winnetka is a village in northern Cook County and holds a populace of just over 12,000. It is a very affluent village in North Shore located 16 miles north form downtown Chicago. It is also thought to be the wealthiest village in all of Illinois. When the people of Winnetka need a glass shower enclosure or glass shower stall, they know where to go GlassWorks! Not to mention, our refined and modish shower enclosures will change your bathroom into exactly what you have been looking for! 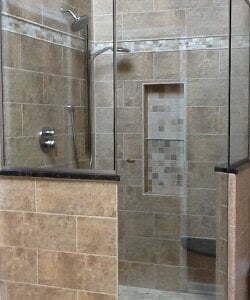 GlassWorks’ frameless glass shower doors to neo-angle glass shower doors, glass steam shower enclosures, framed glass shower doors and custom glass shower doors, and so on, we have the glass shower stall or shower enclosure that you want! Into the bargain, GlassWorks delivers to our customer’s affordable and quality products. Our GlassWorks’ installation technicians are very qualified and value our customers’ requests every time. Pick up your phone and dial our number at: (847)729-5580 to schedule your appointment today. Also you’ll receive a free estimate and if you complete our online form you will receive a 10% reduction!